Originally published under the title "Why This Socialist Will Vote for Harper." Canadian Prime Minister Stephen Harper announces new support for the Royal Canadian Mounted Police and the Canada Border Services Agency to help counter terrorist threats in May 2015. For the past 50 years, my inner socialist has been my moral compass. It has guided me in politics and in my writing. Two prison terms by successive military dictatorships in Pakistan did not break my resolve. It was the 1960s. On one side were the Islamists, backed by the U.S. On the other, a motley coalition of social democrats, liberals, communists, socialists and trade unionists, of which I was a part. Whether one was in Iran, Indonesia, Egypt or Pakistan, options were limited; either support the Islamists, or risk life and liberty to seek modernity through the progressive ideas of the left. From studying the Fabians to the Bolsheviks, marching in solidarity with Vietnam's Ho Chi Minh and mourning the overthrow by the CIA of Iran's Mohammad Mossadegh, my youth was one endless struggle to break free from ignorant medievalism and religious fanaticism. From the first time I voted (in Pakistan's only truly free election) in 1970 to the 2011 Canadian election, I have always backed the left. I am drawn to Justin Trudeau's Liberal plan in this election to invest in the country and to have the courage to admit the government will run deficits for three years. I support Tom Mulcair's NDP plan of offering working parents subsidized, $15-a-day daycare, as well as targeting a federal minimum wage of $15-per-hour. Liberal and NDP leaders have embraced Islamists to woo the so-called Muslim vote bank in urban centres. But this Monday, my tradition will be broken. It's not because I have drifted away from my social-democratic ideals or principles. It's because many Muslims like me, who are on the left in Canada, have been betrayed by our political leaders, who have embraced Islamists to woo the so-called Muslim vote bank in urban centres. I liken being a Canadian to owning a family farm with fertile soil, ploughed and ready to receive the seeds from which crops will grow. But the farmer's family cannot agree on what to plant: canola or wheat, barley or corn. While the family debates this issue, they are unaware of the coming blight, or locust storm, that will devour whatever crop they grow. Despite being repeatedly warned about these threats, the family looks toward the horizon and says: "We do not see any blight, we cannot see any locusts; don't fear monger." But farmers who refuse to take precautions against looming disasters are risking the future of their farm and their families . They are inviting catastrophe. 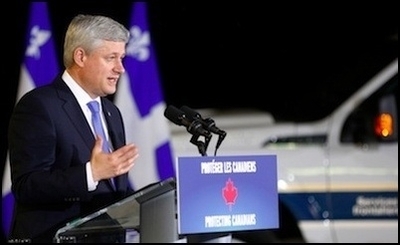 Harper is the only Canadian politician who has raised the alarm about Islamism. For me, the only Canadian politician who has raised the alarm about Islamism in Canada and abroad, and the danger it poses to our future, is Conservative Leader Stephen Harper. So even if some of the crops he wants to plant would not be my choices, I am glad he at least wants to ensure the farm and the family survive. Trudeau and Mulcair have dismissed the idea there is any threat to Canada from ISIS or Islamism. Meanwhile, anti-Islamist Muslims like me have been insulted as "Uncle Toms," at the receiving end of unspeakable vitriol. And it does not end there. Today the Liberals and NDP not only say "fighting ISIS is not our problem," but they passionately defend the most vulgar manifestation of medieval misogyny, the niqab. It's as if Lady Liberty in Eugene Delacroix's famous 1830 painting is no longer bare-breasted, but wearing the niqab. Nearly 200 years later, Canada's left is not merely betraying Lady Liberty, but the principle of equality itself.